Two well-known neo-folk bands performing for the first time in The Netherlands, plus the debut concert of a new Dutch act… The event, entitled “Darkfolk festival”, took place in Lisse, in a region mostly known for its flower bulbs. I knew already that some nice dancenights were organized in club Magnifiosi lately, at least judging by the playlists, because I never made it to Lisse yet. The festival was scheduled to take place on a Sunday afternoon, at a time I’m normally lounging with coffee and newspapers.First we went by train to Leiden, were we arrived just in time to catch a bus. The bus driver was a little amused at the sight of a series of dark-dressed people, who by coincidence all wanted to go to Lisse. We got out of the bus a few stops too early, but the weather was fine so I didn’t mind the long stroll. At 2 p.m. we reached the club, hidden between the various churches of this deeply protestant village. Nice music was already resounding inside. Apart from bands and organization, Magnifiosi was still empty, but soon more visitors trickled in. The venue made a good impression, perhaps not with the most atmospheric interior, but with a separate bar, some cosy corners and a not too large concert hall. Most positive point: the free coffee and tea! Somewhat negative: the stage was very high, so I got a stiff neck from looking up. First band to enter the stage was Volksweerbaarheid. No one knew what to expect from this mysterious act from Nijmegen. They had no material released yet, and rumours were spread that they only practised a handful times. But possible doubts were quickly gone, when the five bandmembers entered the stage and started hitting the drums. A nice concert followed, with a mixture of songs based on martial percussion and more folky songs with acoustic guitars. I appreciated the use of Dutch language a lot, I wouldn’t mind if there would emerge a wave of Dutch-spoken acts! Some of the declamated texts of Volksweerbaarheid were seemingly meaningful political slogans (was it coincidence that the Dutch government fell a few days later?). 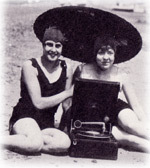 Other songs contained literary (especially writers of the first half of the 20th century, like Vestdijk, Bordewijk, Vaandrager) and other cultural references. Important themes were written with chalk on a blackboard, which was the main task of the muse, who was sitting on a chair for the rest of the time. Then followed :Of the Wand and the Moon:. I had already seen this Danish neo-folk act around Kim Larsen a few times before, but it’s always a pleasure to hear their songs performed live. Acoustic guitars, drums and an electronic background accompanied Kim’s sometimes whispered vocals. The concert had a lot of atmosphere, all the OTWATM classics were performed, like ‘Raven Chant’, ‘Lost in Emptiness’. I only regretted that no new songs were on the menu, while I read that the upcoming album “Lucifer” must be about ready. At the encore, the band even had to play a song (‘Midnight Will’, if my meory serves me well) for the second time. After :Of the Wand and the Moon: it had become dinner time, so everyone spread across the village, to frequent the few local cafeteria’s. Ostara did not sound very neo-folkish, a development that was already noticeable on the last releases. The guitarist was very skilful, rather soulful/funky, whereas the percussionist was experimenting/improvising a lot, even with conga’s and other latin percussion. The songs proved to be good enough to survive any musical setting. I must admit though that I was somewhat relieved when Richard did some martial drumming at the end (on the fierce song with the lyrics “no longer the ruler/no longer the master”), followed by a folky song from a collaboration with Douglas P.